A $15 downloadable game that plays like a $60 retail game? Unbelievablly fantastic! If you were to walk in on someone playing Battlefield 1943, you would be shocked to find out that this game is a downloadable arcade game! "How on earth could a $15 downloadable first person shooter look so good and be rated so highly? How can it even be compared to games like the COD & Halo franchises when it comes to online play? Impossible!" you exclaim. As it turns out, DICE is pretty much a master of their craft. They have created the perfect budget-priced online multiplayer game. The simplicity and yet subtle depth in every match makes for a game that provides exactly what you want from a downloadable game: Quick and highly entertaining fun! The first thing you'll notice during your inaugural match is just how amazing the battlefield is. The beauty of the battlefield, however, is only temporary once the bombs began to fall. Each match begins with an island that contains beautiful trees, shrubs, buildings, houses, bunkers and towers. By the end of the match, the island has been morphed into a smoldering wasteland with the landscape providing clear evidence of a massive battle having just been fought. Scorched land, large craters, smoking rubble and the foundations of what used to be buildings all give signs that for the past 20 minutes a large scale assault was in full effect! You get the option to pick between three classes of military men. The Infantry unit wields a machine gun and rocket launcher, a highly effective close combat machine gunner who enjoys taking the battle right at the opponent, up close and personal. He also is given a wrench which allows him to repair vehicles that have become damaged. The second option is the Scout. He, obviously, is more effective far from the battlefield, waging his war in the rolling hills that are prevalent throughout the 3 maps. Although his secondary weapon is a very weak pistol, he does pack a powerful set of satchel charges that can be placed on the ground or attached to tanks and jeeps (or anything you wish to destroy). The final option is the unit that bridges the gap between the Scout & Infantry, namely the Rifleman. He is the most commonly seen unit on the field. The Rifleman is great for medium to semi-long-range combat, and is doubtless the most effective unit for taking out enemy troops and jeeps with his grenade launcher attachment. Combine that with a set of hand grenades, there's little doubt that you will find yourself choosing him to fight with most of the time. There are only three maps in the game (plus an additional air battle only map, Coral Sea) yet they're all so ridiculously gigantic that it will likely take a while before you're familiar with all of their intricacies and strategic positions. There is only one mode to play with on the three main maps. Two teams of up to 12 players compete for five different bases (marked by flags) scattered at specific locations across the various Pacific battlefields. Having captured most of the flags and/or getting kills will lower the life bar of the enemy team, and upon emptying it completely you'll have won (ala Star Wars: Battlefront series). Each battle lasts for about 20 minutes and there are no lobbies or significant load times once you've made it into the main menu of the game. 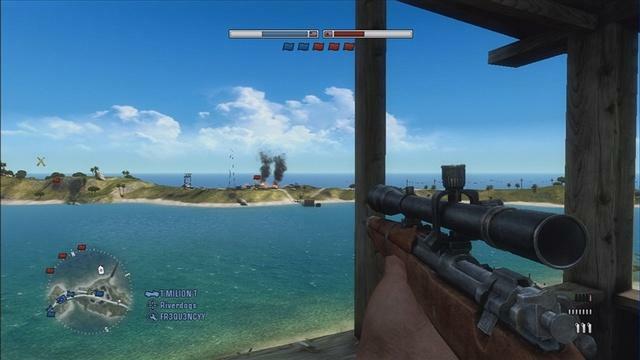 As a result, Battlefield 1943 really sets itself apart as one of those perfect games to play when you've only got a little bit of time to spare. Finally, there are the vehicles. The tank is a slow armored goliath with both a large cannon and supplemental turret. The driver can utilize both guns himself, or a teammate can jump aboard and take control of the turret. The jeep is used mostly for transportation purposes. However, the turret attached to the rear (ala Halo), is useful when engaging foot soldiers. Unlike the tank, a teammate is needed in order to actually utilize the turret. The same would apply to the boats. Like the jeeps, these are seldom utilized for anything other than a means of transportation from the starting base (usually a large frigate) and can carry up to 6 soldiers with two attached turrets. Then there are the planes. The plane is the only vehicle in the game that will require some serious practice to master, but that makes it that much more rewarding once you finally figure it out. Planes, in the hands of a skilled pilot, are easily one of the most dominant weapons in the game. 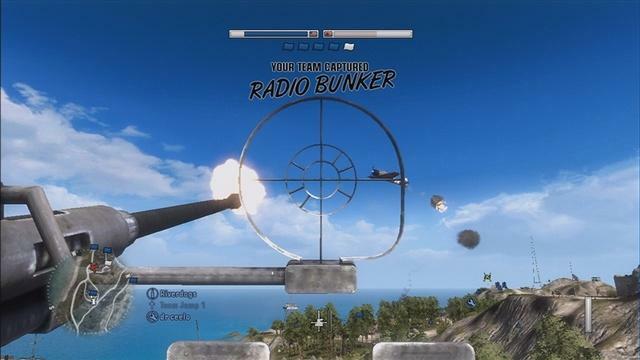 With their ability to strafe soldiers with their machine guns and their knack for dropping bombs on unsuspecting tanks and bunkers, you will quickly become aware of the AA emplacements as a means of defense against these aerial attackers. Of course, even if you start pounding an airplane with the AA gun, this does not mean an instant kill of the pilot since he also has the ability to eject from the plane and parachute to safety. Up to this point, I've had nothing but praise for this game. However, I must point out the one and only glaring flaw. 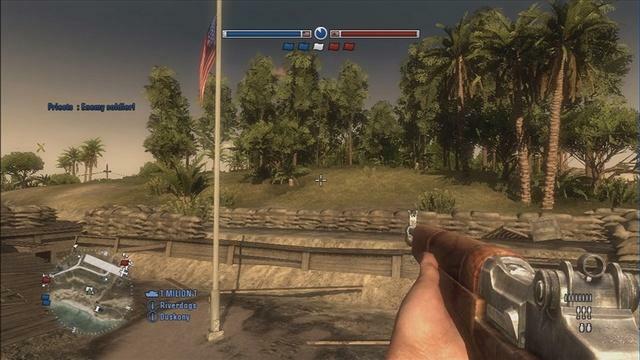 The online play for Battlefield 1943 can at times contain severe lag. This has been identified and well documented as being on both platforms (Xbox 360 & PS3). This problem has been evident since the inception of this game and EA has done nothing to improve it. The common workaround is to exit the game and just join another in hopes of joining one that has a better server. But since you cannot join specific matches (it's all random), there's no guarantee that you won't be placed into the same one you just exited. Another thing to note, although not a flaw, is that the learning curve on this game seems to be a little longer than most other games. Sniper rifles require good precision to be effective. No more using them like a shotty-snipe! 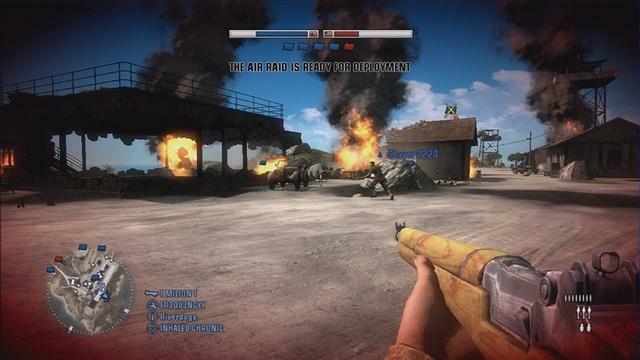 Driving tanks and flying airplanes are not easy and you'll die many times attempting to take on a single soldier. Just because you have a vehicle, doesn't mean you'll own the map! In conclusion, this is easily one of the top downloadable games ever made and it definitely rivals any online gaming FPS that has ever been created. Despite the issues with lag, the game is still riveting. 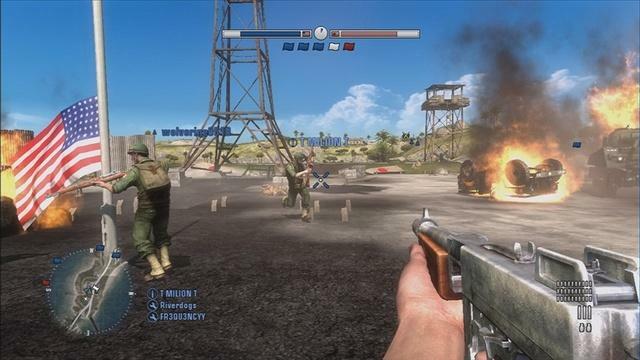 The balanced classes, diverse vehicles, and dynamic maps provide the kind of variety and replayability that is the hallmark of the most engaging online shooters, making Battlefield 1943 well worth every dollar!